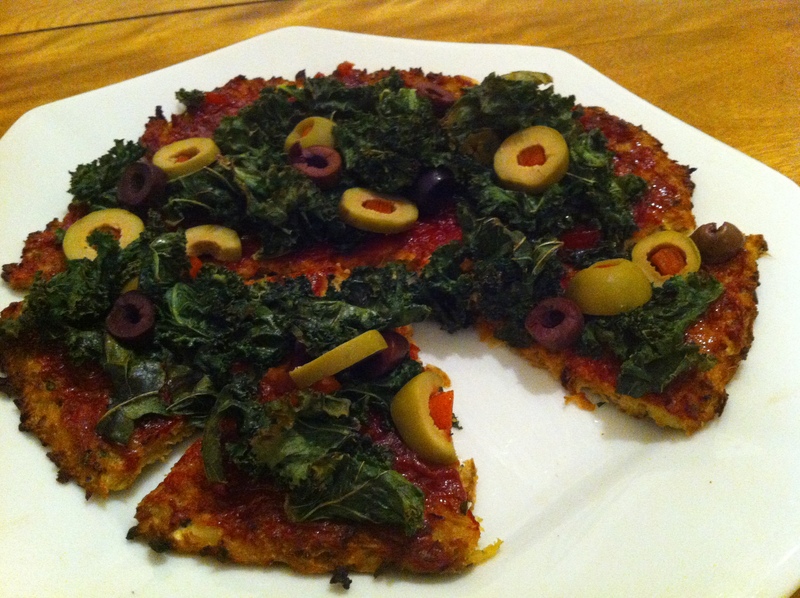 I will admit to being a total girl and getting the idea for a cauliflower-based pizza crust from Pinterest. I mean, let’s be honest though, Pinterest is amazing! What else would I spend my time on? Something meaningful and productive? I think not. I had recently seen lots of pins about a cauliflower pizza crust and/or cauliflower “bread sticks.” After making Tandoori Cauliflower a couple weeks ago, I became cauliflower’s biggest fan (never really liked it before). I knew I had to test out the crust idea. Plus, at least half of my coworkers are allergic to either gluten and/or dairy. 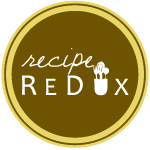 So I am always looking for recipes that they can also enjoy. Most of the recipes I found on Pinterest contained mozzarella cheese, so I adjusted to my needs (dairy-free, gluten-free). I was skeptical as to whether this would taste great or gross, and must say that my expectations were blown out of the water! This was absolutely delicious. My only problem was that I didn’t make enough of it. I can’t wait to try it with different toppings and maybe a little cheese (I don’t have an intolerance, so why punish myself — cheese is delicious). Preheat oven to 400 degrees Fahrenheit. Heat olive oil in pan for 1 minute. Add minced onion and saute for 5 minutes. Add cauliflower and cook another 5-7 minutes. Remove from heat and transfer to medium bowl. Add remaining ingredients. Mix until well incorporated. Line a baking sheet with parchment paper and spread cauliflower mixture onto parchment. Shape into 8″-9″ circle. Bake at 400 degrees for 25-30 minutes, or until top is browned and crust is crisp. Top with your favorite pizza ingredients. I spread mine with tomato paste, sweet pepper jam, crunchy kale and kalamata and green olives and baked an additional 7 minutes. With the pepper jelly and an extra sprinkling of chili pepper flakes, it was the perfect sweet/spicy combo! *Since the original recipes I saw called for 1 cup shredded mozzarella, I replaced with 1/2 cup nutritional yeast to give a cheesy taste without actual cheese. If you’ve never used nutritional yeast, it has a cheesy taste, is vegan and gluten-free and contains protein (6 g per 1/4 cup), phosphorous (supports bone health) and potassium (helps regulate blood pressure among other things). Not to mention that 1/2 cup (the amount used in the entire recipe) contains only 90 calories (plus 12 grams protein). You can find nutritional yeast at Whole Foods and/or at your local health food store. Butternut squash, with its creamy texture, is the perfect comfort food. Like butta, some might say. Plus, because it has both sweet and savory notes and is extremely versatile; not to mention it is loaded with nutrients. Nutrition breakdown: half a cup of butternut squash is only 50 calories and provides a whopping 260% your daily need for vitamin A, plus 40% your daily need for vitamin C (vitamins A and C boost immunity, can decrease inflammation and contribute to healthier skin, eyes and an overall healthier body). You’ll even get a little iron and calcium in that 1/2 cup serving, though you’ll probably want to eat more than half a cup! My one issue with butternut squash, however, is that can take 45-60 minutes to cook. Thus, I had a butternut squash sitting on my counter for several weeks before I got around to making it. Did I mention I made it in 30 minutes? The key is to cut it up small. With a VERY sharp knife. Butternut squash doesn’t play around…you have to put major – at least for me – muscle into cutting that baby up. That expression, “no pain, no gain,” can absolutely be used here. Completely worth the minor hassle to get a deliciously cooked butternut squash, though. Check out how I used it several ways! Directions: Toss all ingredients together. Yep- it’s that simple! *To roast butternut squash, peel it and cut it into 1.5″ cubes. Drizzle with olive oil or use cooking spray and bake at 350 degrees for 20-30 minutes. Note: the smaller the pieces you cut, the faster it will cook. Directions: Preheat oven to 375 degrees. Remove stems from washed/dried portabellas. Place on a baking sheet and drizzle with olive oil. Mix all remaining ingredients (excluding cheese) together and stuff into the prepared mushrooms. Top with shredded or thinly sliced cheese. Bake for 15-20 minutes, until mushrooms are thoroughly cooked and cheese is browned and bubbly (and thus, delicious).